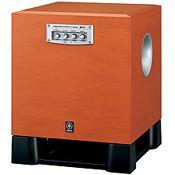 Powerful 270W Subwoofer with Advanced Technology for Top Class Sound Quality. Love its sound. Clear and loud. Works great with my Jbl amp. Especially fun makes the punchy bass in music mode. You can listen very loud and nonetheless the woofer will bring you hard precise BANG and not BOOOM when the source is BANG :-) The other nice thing is that you can also feel the beats of the Yamaha SW515 and thats sometimes unbelievable if U have a look to its price. I'll use it for partys and to make mixes for them. If some people have problems with this subwoofer, they should invest in ideas how to position the woofer correctly. Usually this is a very good powered subwoofer, that also worked very well when we made a party in a shop with 65 m²! Yamaha's SW515 is a deep impressive subwoofer. Something u can feel and listen very loud. Nice looking sub, the finish is excellence! Not very heavy to move it around. Plenty of distortions, clipping, flapping and boomy bass. Dosn't feel powerful as what the 270W claim. Not able to reproduce bass to the 20Hz range at useful SPL. At the low end of the bass, it just feels nothing. I purchase this sub after hearing it in their showroom, sounds great, producing bass that you can actually feel. Back home, I did some testing. As this sub is equip with “Advanced YST II (Yamaha Active Servo Technology II)”, it should be able to “drive the speaker cone with even tighter control” as Yamaha claim. With most music, it sounds good, some tight bass, compare to the YST-SW315. If you were to pump it with bass intense music, for example, music from Bassotronics, the flaws of this sub is really going to show. Plenty of distortions, clipping, flapping, very boomy. As for movie, which I’m really into, I found the sub clip once I play movie soundtrack that contain some low frequencies materials. Some examples would be the starting scene from “The Day After Tomorrow”, Chapter 1 from “U-571”, starting scene from “I robot”. It’s just trying to reproduce the frequencies it can’t handle, even at low volume. Frankly, I’ve NEVER come across a sub that clips at low volume; even cheap subs. Subs that I come across would just not reproduce the frequencies that they can’t produce. The “High 270W Dynamic Power” is over claimed, it just don’t feels like a 270W sub. I’ve come across a 100W sub, and in terms of power output, it’ll definitely put the Yamaha to shame. The “20-160Hz Low Frequency Reproduction” is also over claimed. The issue is the same as their YST-SW1500 model, it does reproduce to the 20Hz range, but the SPL is so low that it’ll be of no use at all even for a room size of my bathroom. The SPL (sound pressure level) of this sub just roll off radically at the mid bass range, while the bass it reproduce at the lower end, the distortions is just sky high. In my opinion, buy this sub if you intend to use this sub for a small size room, all your playback materials doesn’t contain ultra low frequency (Which movies soundtrack always do..), you don’t mind high distortions and you don’t mind your sub to clip there and then when you playback movies. For now, it’ll be sitting at a corner of my store room, while I enjoy my movies with my newly purchase Velodyne Sub. Velodyne SPL-1000R, Velodyne SPL-1200R, and some japanese brand subs.